Lasko Products, Inc. has recalled 4.8 million box fans in Massachusetts and across the country after receiving seven reports of fires associated with motor failures, including two house fires and one barn fire. According to the Consumer Product Safety Commission, the Lasko fans pose a hazard due to an electrical failure in the fan’s motor. No injuries have been reported, but the fires resulted in extensive property damage. We urge Massachusetts consumers to check fans in their homes. It is also important to check your storage. Many of us in New England are not using fans right now because it is winter. But we use them plenty in the warm weather. 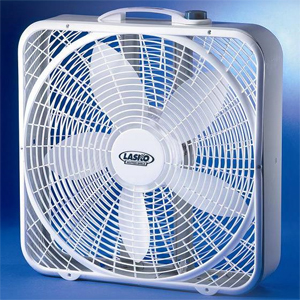 Lasko is a large manufacturer; if you have a box fan, there is a good chance you have a Lasko model. So please remember to check your storage, now or before using your fans this Spring and Summer. The defective units have “Galaxy” and “Lasko” printed on the front of the fan. They were sold nationwide from July 2002 through December 2005 for $12 to $15. Lasko is a major company and many of us have Lasko fans. The fans were sold at a number of mass merchandisers. Visit the Consumer Product Safety Commision’s website to view the recall notice. The model numbers for the Lasko box fans are 3720, 3723, and 3733. The Galaxy models include 4733 with the date “”2002-03″” or “”2003-04″‘. The West Chester, Pennsylvania company said consumers should stop using the product and contact Lasko for a free replacement fused plug safety adapter. If you have an old fan, it may be a good time to purchase a new model. Product recalls which affect you may be issued off-season. For this reason, it is always a good idea to check for product recalls when we change seasons and appliances. The model number should be printed somewhere on the product. Search for the model number on the Internet and on the Consumer Product Safety Commission website. You can also try searching by the manufacturer’s name. If you cannot check your fan now, make sure to put a reminder on your electronic calendar. Check the model numbers on other seasonal products as well, including your grill and children’s products, toys, bicycles and swingsets. Carefully inspect your products at the same time. Swingsets and any other product left outside can shift position or winter may have weakened the wood. Tagged: "Boston product liability law firm", "Boston product liability", "defective consumer products", "defective fans", "defective motor vehicles" and "defective products"